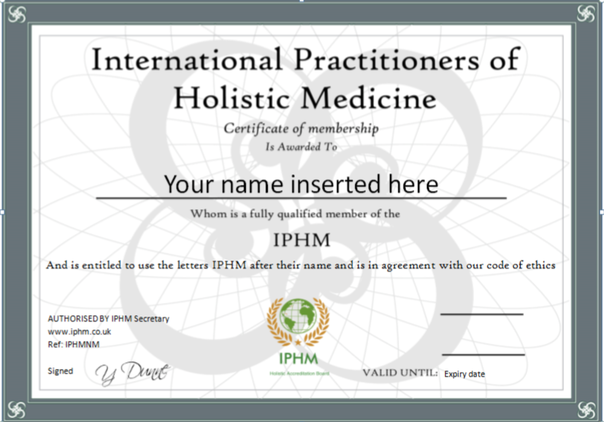 The Return to Health International College of Natural Medicine is an international accredited course training provider listed with the IPHM (International Practitioners of Holistic Medicine). All of our certified course programs have been thoroughly assessed by the IPHM and have been approved for accreditation. Students who undergo our course programs have the assurance that their certification will have international accreditation. They also have the option to apply for insurance coverage and / or to become a member with the IPHM. Membership provides significant benefits such as being a part of a worldwide accredited natural therapy practitioner association which instills confidence in your clients and gives them assurance of your qualifications and your skills. It also makes applying for insurance coverage easy and with membership with the IPHM, there are discounts for members, as well as the right to use the letters IPHM after your name. Please see www.iphm.co.uk for more information.